LS7 Valve Drop Issue. What you need to know! 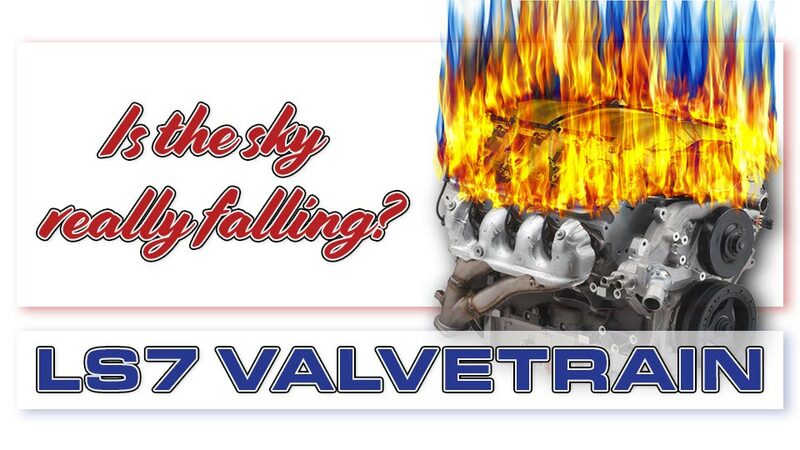 It seems a lot of questions, concerns, information and misinformation exists related to the LS7 valvetrain issues. We felt it might be helpful to our dealers and customers to summarize what we have learned over time about these issues. The concern often seems to arise from the “Forum Chatter” – where a high percentage of customers who actually experience an issue – go to seek info and share their grief. We have seen exhaust valves become separated from their stem resulting in mass destruction – but have yet to see it on a completely stock engine. Higher intake runner (LS7) which improves the airflow path while at the same time requiring a longer valve and greater unsupported stem area between the valve head and the bottom of the guide. Ultra-light weight titanium intake valve and a hollow sodium filled exhaust valve. We don’t feel the smoking gun is found in any one of these differences – but, some of them culminate to create the issue that keeps so many LS7 owners awake a night. …it was determined that a machining error in the valve guide had occurred at our head supplier. I have a hard time buying into this one – as I seriously doubt they finished the guides in the shape of an oval (as we find in a typical “out of spec” LS7 guide). When we looked closely at the rocker to valve tip sweep pattern we find the stock steel radiused rocker takes a trip across over 60% of the of the valve tip or lash cap as it were. It’s a simple and light design that works fairly well when the valve lift stays under .600 as GM intended. When we increase that lift however, the valve is subjected to greater side loading. Effect: Sideloading on the valve, causing additional wear. The next theory is that the manufacturer of the titanium intake valves failed to get the chromium nitride coating right in some instances – resulting in the increased guide wear. While it’s true that titanium hates everything except titanium, I am more prone to believe the coating simply wears through due to excessive side load, which then allows the titanium to go to work on the remaining guide. Effect: Increased abrasion from exposed titanium. In our opinion the third contributing factor is the length of the guide versus the length of the valve. The guide is the same length as the Other LS engines but the valves are longer. Nearly all the additional length is between the bottom of the guide and the valve seat. We have found no appreciable flow reduction after extending the guide an additional .250 into the runner providing additional stability. 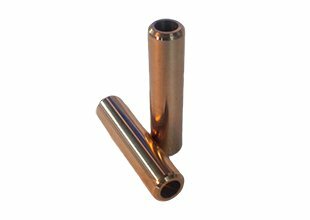 Concerning the guide material, the powdered metal guide is a very durable material that works extremely well on LS heads everywhere. On a street engine that doesn’t get torn down every season it is far superior to a standard bronze guide. We feel the material itself is not a contributing factor, however manganese bronzanium 90 guides extended further into the port have proven an excellent solution during our endurance testing. 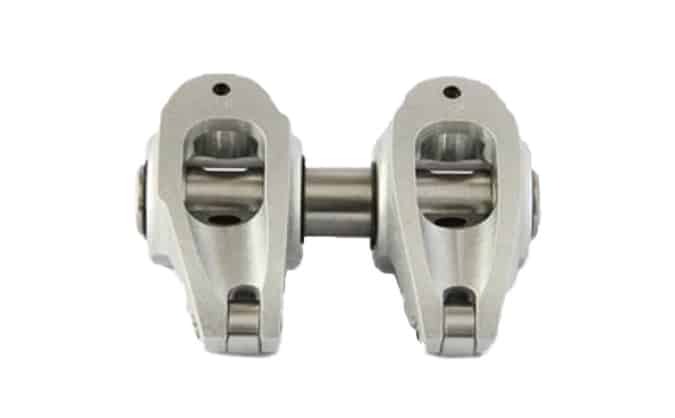 Rocker arms play a major role in a high performance valve train and also come at a price, currency being one form and mass being the other. We have studied most of the options currently available for the LS7 and will attempt to provide some insight. A roller tip rocker when in a proper geometric configuration does a phenominal job of reducing side load on the guide and directing most of the energy towards the task of opening the valve. In high performance and racing applications where cost and complexity aren’t as negative a factor as in mass production manufacturing they are very desirable. For solid roller applications the shaft mount offerings from Jessel and Crower are our picks (as the mounting girdle distributes the load more reliably over the head casting vs. the cast stand bearing the burden). Concerning the bolt on products available we have tested Harlan Sharp, T&D, and Yellow Terra. We checked net lift on all the brands and found the sweep pattern and ratios to be acceptable. All slightly over ratio as I am sure is by design. 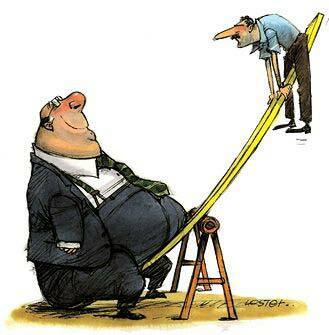 Most customers won’t take issue with a tic more lift but don’t give them less! Out of the three, the bulky aluminum body Harlan Sharp SLS78A, was the only true bolt in so far as not having to clearance anything on the stock casting. We did have to dust a corner off with the belt sander on two end intakes and two exhausts when using on a BR-7 casting due to a slight difference in the valve cover rail. These are a fully adjustable rocker and can be used with a solid roller. They will require a taller valve cover as do all of the adjustable solutions. 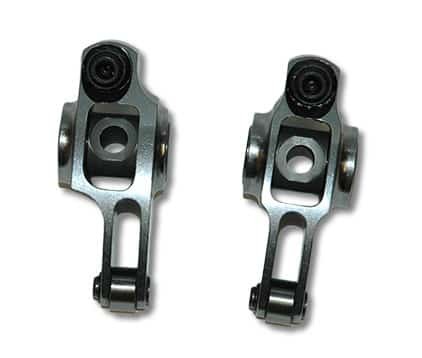 The T&D 15015 stock eliminator rockers are more expensive, but are a very nice piece. Billet steel construction yet very light where it counts. We had to clearance the upper valve cover rail even on stock castings, otherwise they are good to go. The Yellow Terra which is advertised as retaining the stock cover was a bit more of a challenge. They are non adjustable and use a .125 thick hex nut and a thicker gasket to gain the needed cover clearance. I tested them on a .648 lift set up by putting a dial indicator on the cover and rolling the engine over using the stock gasket and measured .152 movement, so the math tells me a valve cover spacer or tall cover would be necessary. The other issue we ran into was we had to relieve one side of the bottom of the stand otherwise they lock up when they get close to seating on the stand. We tried 2 different sets of castings and one set was worse than the other but both needed some work. I am sure due to some core shift it’s not the case on every set of heads but still noteworthy. Lift at .630″ or less, and true the tips. 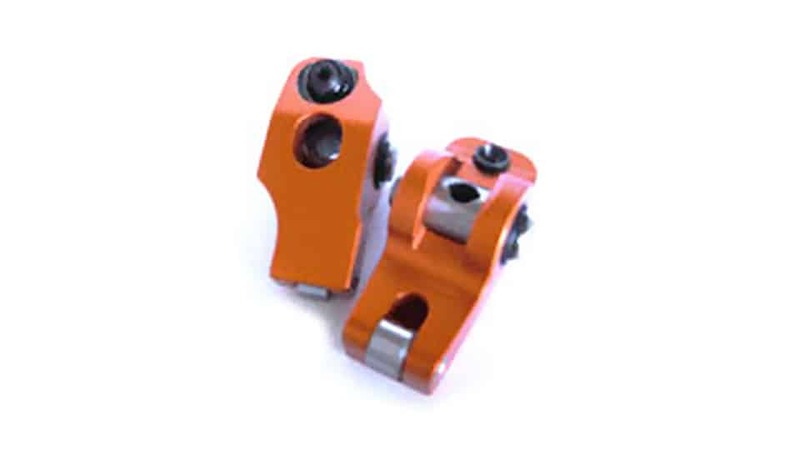 Micro-polished and bronze bushed is a nice option on the stock rockers – although we have seen few GM trunnion bearing failures where some type of trauma was not the root cause. (We have seen more failures with the trunnion bearing kits where the trunnion material doesn’t appear hard and or smooth enough to act as a bearing race. The OEM bearings have a hardened steel inner race to provide the needle bearings a nice surface to run on. For that reason we sell only bushing kits). Refer to our findings provided earlier. Polish and coat the original Del West intake valves. 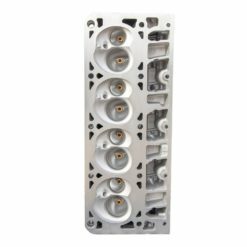 REV offers a nice solid stainless 1.614 exhaust valve that’s affordable and totally adequate for most street applications. (It weighs in about 18 grams heavier than the F2042P but is still under 100 grams). Ferrea F-2042P-8 exhaust valves for N/A applications. We like the Ferrea F-1597P-8 for forced induction applications. Will vary with intended use and cam spec. Don’t forget the lash caps on the Del West Titanium intake valves. CHECK OUT OUR COMPLETE LS7 RECONDITIONING PACKAGE! 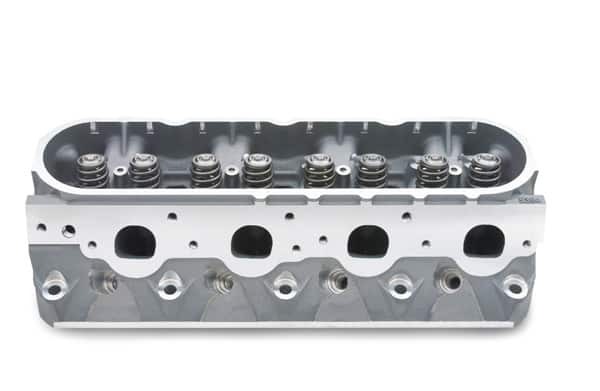 Our LS7 Cylinder Head Reconditioning Package solves all of these durability concerns – while improving power and torque across the power band. If you are a concerned LS7 owner – this is a no brainer. This entry was posted in Tech Spotlight. Bookmark the permalink. GPI SS4 Cam Only LS3 (Stock Heads) Gunning for 9’s!! Southern Outlaw: 2018 Season Award Ceremony @ GPI! Makes total sense — going outside of the factory ‘design’ specs should indicate the need to do more than just ‘pop’ in a cam and springs. As far as the LS7, I don’t believe this was an issue with the engines installed in the 14/15 Z/28s — unless someone went ‘large’ on the cam. This is why GPI is a leader in the performance arena.